Buffalo has the distinction of being home to the first Polish Baptist Church in the United States. In 1890, Rev. Joseph Antoszewski was invited by the Buffalo Baptist Union to start a mission in the city to find converts amongst the Poles in the East Side and tend to the Baptists already living there. 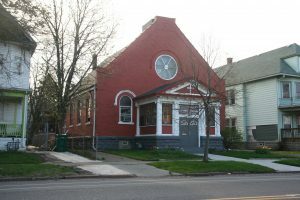 On October 31, 1894 with 30 members, the Polish Baptist Church was chartered in the basement of the Reid Memorial Chapel on William Street. In 1907, after moving to a couple of sites, the members hired John H. Coxhead to build them a church on Fillmore Avenue. On June 17, 1907 the building was dedicated and would serve as the home of the congregation until July 1963 when they relocated to Cheektowaga. The church is now home to the Fillmore Avenue Baptists.